Fang Zheng was one of the hundreds of thousands students who had participated the 1989 student movement pretty much anonymously. Nobody probably would have noticed him if not for the few terrible seconds in the early morning of June 4, 1989. In that fateful morning, Fang Zheng was walking near the tail end of student formation as they withdrew from Tiananmen Square and on their way back to campuses. At Liubukou, they crossed Chang'an Avenue and slowly walked along its wide bicycle path toward west. He met up with a female student from his school, Beijing Sports College, and they walked together as he comforted the frightened female. It was then they heard the rumble of approaching tanks. Looking back, he got a brief glimpse of several tanks charging in from behind while shooting teargas canisters. Terrified chaos erupted all around them. In the heavy smoke, the female student fainted. Fang Zheng struggled to push her onto the sidewalk, which was blocked by an iron fence. After a final desperate shove, he managed to get his companion onto the fence but that left himself no time to escape. The last thing he remembered was that both of his legs were caught under the tracks of a tank and separated from his own body. Fang Zheng survived. The female student he had saved was under tremendous pressure from authorities and refused to validate the circumstances of his injury. He was expelled from school and left to survive on his own. In 1992, he won gold medals in discus and javelin throwing in the All-China Paralympics Games. But his dream of playing in Special Olympics was crushed for political reasons. His story was recently profiled in The Independent. Fang Zheng and his family finally arrived in America recently where they plan to start a new chapter in life. They are sponsored by Humanitarian China, a fund established by former student leaders including Zhou Fengsuo and Feng Congde. During a brief trip to San Francisco this weekend I had the pleasure to meet Fang Zheng and his wife, who had come to his side during his darkest years. Despite the hardship and an uncertain future, they displayed amazingly great spirits and optimism. 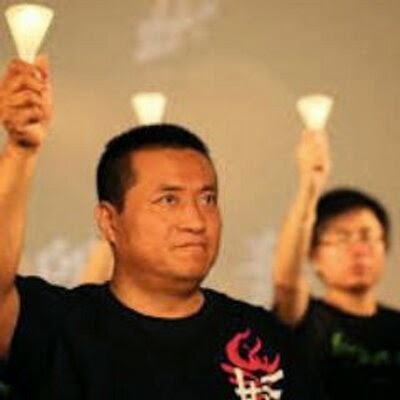 Updated on 9/3/2009: Fang Zheng is standing up again. Updated on 10/8/2009: Fang Zheng is dancing with his wife. Updated on 2/14/2011: Fang Zheng is driving. What a story. Fang Zheng is a true hero, in and after 1989. Thank you so much for all your research and hard work to produce the book!